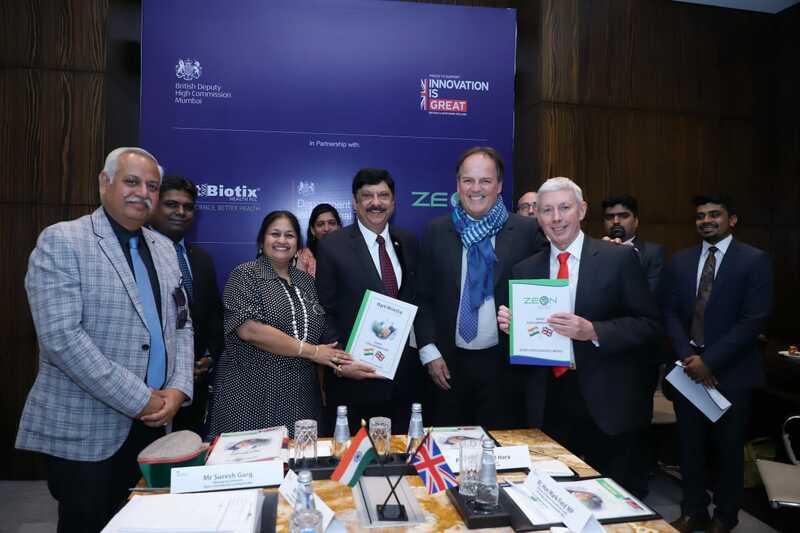 British company Optibiotix has signed an exclusive manufacturing and supply agreement with Indian Healthcare company Zeon for the use of OptiBiotix’s science-based weight management technology, SlimBiome®. This partnership was facilitated by the Department for International Trade, and the Rt. Hon Mark Field Minister of State for Asia and the Pacific, UK Foreign and Commonwealth Office was present at the official signing ceremony held on March 2 at St Regis in Mumbai on 2nd March. Many parts of India have faced cases of malnutrition and this fast-developing economy is now also battling rising obesity. Access to unhealthy and processed foods has grown following India's increased integration into global food markets. Rising middle class incomes have also contributed to increasing the average caloric intake per individual among the middle class and above income households. According to the National Family Health Survey, the number of obese people in India has doubled over the past ten years. In addition, India reported 72 million cases of diabetes in 2017 , and an estimated 122,700 men aged 30 and above die from diabetes in India every year. Zeon is India’s leading manufacturer of nutraceutical and herbal products with expertise in developing custom formulations for the food, herbal, and pharmaceutical industries. The company's customers have included French food giant Danone as well as multinational Indian pharma firm Sun Pharmaceutical. Following the confirmation of the deal, Zeon now has a license to manufacture and supply SlimBiome® across India in return for a 50% profit share. •	Feel fuller and are less hungry. •	Experience fewer food cravings. •	Change their food choice to eat less sweet and fatty foods. This press release was distributed by ResponseSource Press Release Wire on behalf of Vane Percy & Roberts in the following categories: Health, Business & Finance, Medical & Pharmaceutical, for more information visit https://pressreleasewire.responsesource.com/about.